Gorshenin Institute hosts discussion on "How to facilitate the work of doctors in ATO?" The organizer of the event is Gorshenin Institute. LB.ua has hosted an online news conference "How to facilitate the work of doctors in ATO?" dedicated to the signing of the memorandum on cooperation between Valentyn Nalyvaychenko's social movement Justice and the Pirohov First Volunteer Mobile Hospital. In the framework of future cooperation, they will send a new mobile diagnostic and treatment unit to eastern Ukraine. Taras Konstanchuk, director of the Army of Dignity programme. 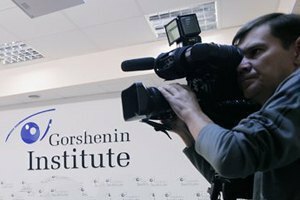 Make sure to mention Gorshenin Institute as the event organizer in the news reports.